Save Borb Bay from calamity! 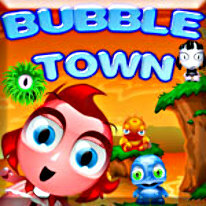 Bubble Town: You've played it on Facebook and MySpace, but now you can download it! Save Borb Bay from calamity in this addictive arcade-puzzler - one shot from the chute and you'll be hooked! Bubble Town is the arcade-style puzzle game that will test your wits, not just your reflexes. Join the unforgettable cast of characters for an adventure of bubble-popping proportions - just watch out for the Danger Zone! Bubble Town needs you, will you step up?